Founded in 1967 as a sovereign principality, Sealand is located in international waters just seven miles off the eastern shores of Britain. The smallest state in the world, it is a celebration of independence and individuality, which is why we believe that people should be able to hold any title that they aspire to. We offer a unique service: selling the right to call yourself a lord or lady, baron or baroness, a count or countess, or even a duke or duchess. If you have ever dreamed of being able to label yourself thus, we can make this a reality for you. This is why we give those who come to us the choice of four different noble ranks: lord or lady, baron or baroness, count or countess, and duke or duchess. Becoming a lord or lady means obtaining the lowest rank of peerage, and such titles can be yours for just £29.99. Giving you the chance to style yourself as such on any future documentation, this represents the achievement of a life-long dream for many. In traditional parlance, a baron is a title of honour. Conferring real prestige on those who hold it, it is sure to have your peers looking at you with a new-found respect, and it can be yours for just £59.99. Should you choose to obtain it, you’ll certainly be in good company, with numerous members of the royal family styled as such, including Prince Charles, Baron of Renfrew; Prince William, Baron Carrickfergus, and Prince Andrew, Baron Killyleagh. Count or countess is a rank recognised throughout Europe, typically coming just below dukes, who hold the highest rank of nobility. Carrying a great degree of gravitas with it, such titles are traditionally associated with great wealth and power, lending real prestige to those who can count themselves as such. With our assistance, you could of course be among them – for a price of just £199.99. This would place you in a class that traditionally includes not just the nobility, but many former prime ministers elevated to it, including Harold Macmillan and Margaret Thatcher. Dukes and duchesses are the most highly ranking nobles in existence, with only the monarch themselves holding a more elevated and exalted position in society. The queen herself claims such a title, being both the Duke of Normandy and the Duke of Lancaster, and you can join her in this, for a one-time cost of just £499.99. Should you too wish to count amongst the most powerful and prestigious class in society, then seize your opportunity today with the help of the Principality of Sealand. Becoming a Sir or Dame earns you the upmost respect among family and friends and is a privilege when completing documentations. 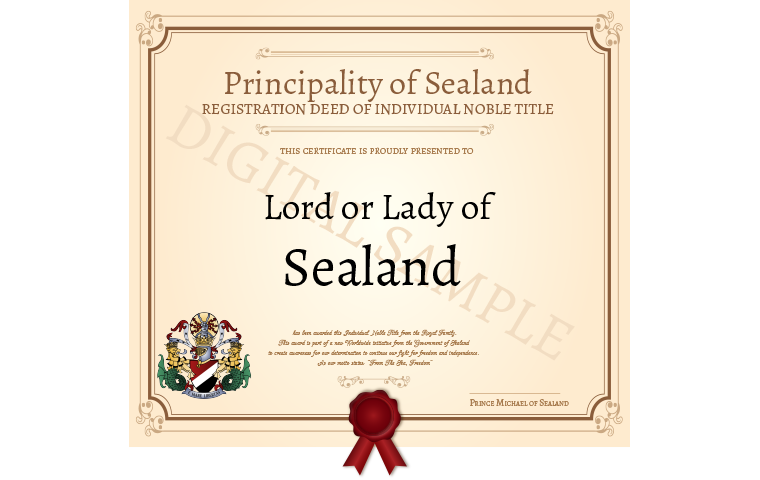 When becoming a Sir or Dame of Sealand you will be securing your place within The Sovereign Military Order of Sealand. The order was created from a select group of individuals who were to defend the Sovereign Nation should Sealand come under attack. 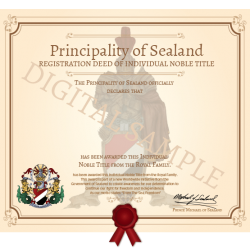 If you or someone you know can help to defend our nation and deserves to acquire one of the highest honours an individual can achieve, then becoming a Knight of Sealand is the perfect answer, at just a one-time cost of £99.99. Buy Your Noble Title Today! If you have ever wished to count yourself amongst the most respected and envied in existence – the nobility – we can offer you the solution you’ve been searching for. Become one of our number today, and you’ll never have to sign yourself as a mere ‘Mr’ or ‘Mrs’ again.